As the nation’s maritime first responder, the U.S. Coast Guard is devoted to helping boaters in distress. Within this mission, one critical issue is finding people in the water. Towards that end, the U.S. Coast Guard Research and Development Center (RDC), in collaboration with the U.S. Department of Homeland Security (DHS) Science and Technology Directorate (S&T), has launched the U.S. Coast Guard Ready for Rescue Challenge, a $255,000 prize competition that seeks boater safety solutions that will help make it easier to find people in the water. When a person becomes separated from their boat or other watercraft, they can be left isolated in open waters. A life jacket or personal floatation device (PFD) keeps a person afloat while they seek safety, however, a person in the water is a small, moving target, and even in a successful rescue mission, locating the person can take hours. New boater safety solutions have the potential to greatly improve the chances of a successful rescue. Current technologies such as electronic locators and reflective materials on flotation devices can help the U.S. Coast Guard find people. However, adoption of these technologies is not prevalent, due to factors such as cost, comfort, style, and awareness. The U.S. Coast Guard Ready for Rescue Challenge invites you to submit a concept for a solution that helps make a person in the water easier to find. The best solutions will be effective, affordable, and hold the potential for wide adoption by recreational boaters. This call for concepts is the first phase of an anticipated three-phase prize competition. Phase I concepts could include a new or updated life jacket or PFD, an attachment to a life jacket or PFD, or a new safety device boaters use in addition to wearing their life jacket or PFD. “Boater safety solutions that harness new designs and technologies can improve the chance of a successful rescue,” said William N. Bryan, DHS Senior Official Performing the Duties as Under Secretary for Science and Technology. Those interested in participating in the Challenge should submit their concept by 4:59 PM ET, Monday, October 15, 2018. The judges will evaluate the submissions and will select up to five monetary prize winners and up to five non-monetary honorable mention award winners. $25,000 will be distributed evenly among each of the Phase I monetary prize winners. “The U.S. Coast Guard is devoted to helping boaters in distress. One critical challenge is finding people in the water,” said Bert Macesker, RDC Executive Director. In Phase II, selected participants from Phase I will participate in a “Piranha Pool” to pitch their solution and compete for a total prize pool of $120,000. This prize will assist each monetary prize winner in developing their concept into a working prototype. In Phase III, the Coast Guard will field test prototypes alongside standard USCG approved safety equipment. At the conclusion of Phase III, the judging panel may award a total $110,000 in additional monetary prizes. To Learn More about the U.S. Coast Guard Ready for Rescue Challenge, visit readyforrescuechallenge.com. The Annual ‘ASTORS’ Awards Program is organized to recognize the most distinguished security vendors, and government/public safety agencies, as the nation continues to respond to escalating threats from home and abroad. The U.S. Department of Homeland Security Science (DHS) and Technology Directorate (S&T) took home Four 2017 ‘ASTORS’ Platinum Awards for ‘Excellence in Homeland Security’ at ISC East in New York City. 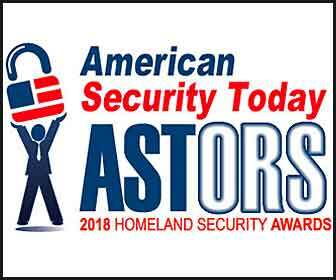 American Security Today will be holding the 2018 ‘ASTORS’ Awards Presentation Luncheon to honor Nominees, Finalists and Winners at ISC East on Wednesday, November 14th, 2018, in New York City.